Want to make it vegetarian? No problem. 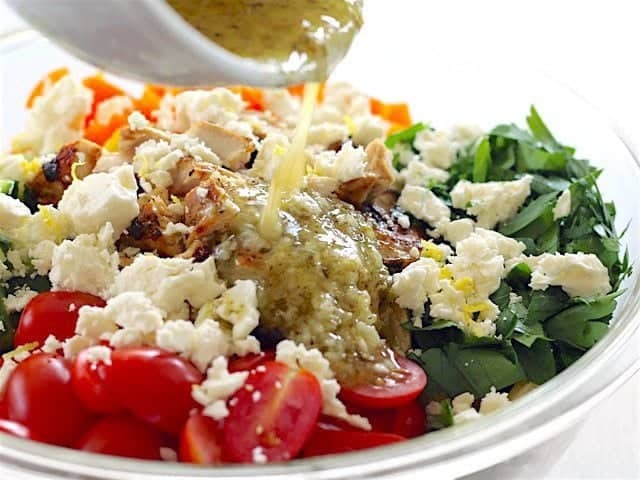 Just skip the chicken and you can probably halve the dressing/marinade (or just make the full batch if you really like a lot of dressing on your salads). 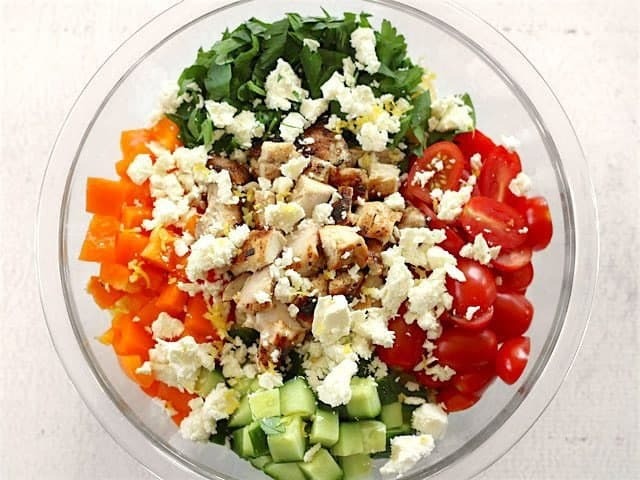 The medley of vegetables are plenty to keep this salad filling and interesting on its own! 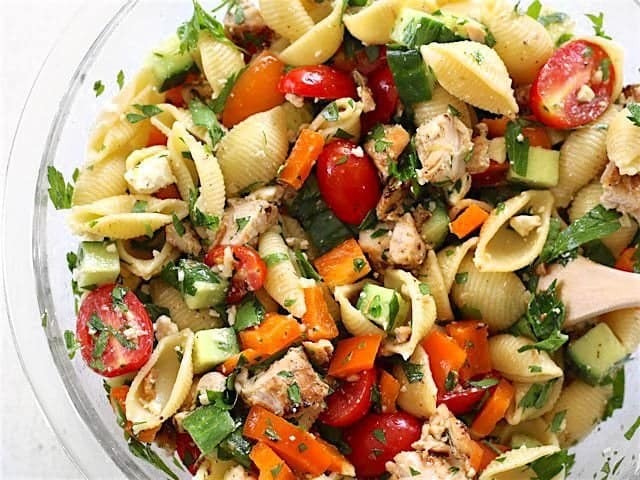 Greek Chicken Pasta Salad is the perfectly refreshing and filling summer meal with its medley of vegetables and tangy lemon garlic dressing. 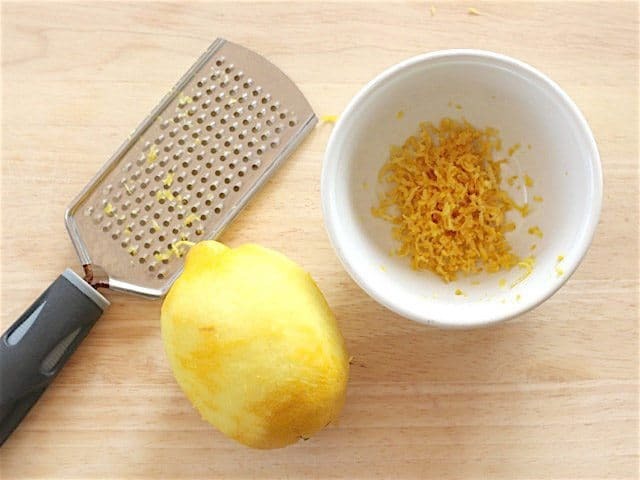 Use a zester, microplane, or small-holed cheese grater to remove the zest from the lemon. Set the zest aside. Squeeze the juice from the lemon into a separate bowl. You'll need at least 1/4 cup juice. 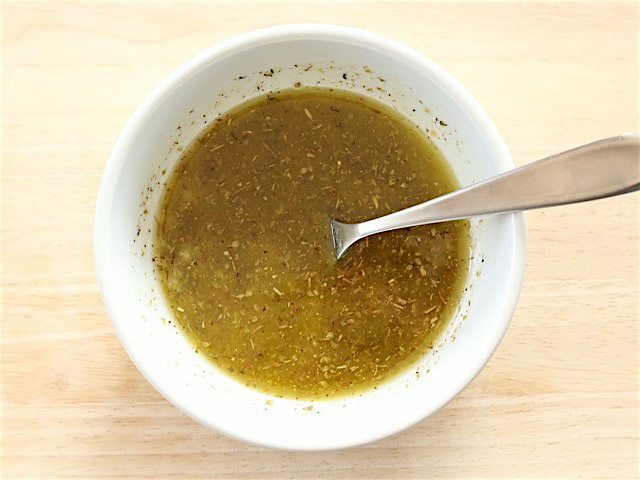 Prepare the dressing and marinade by mincing two of the three cloves of garlic and combining them with 1/4 cup lemon juice, olive oil, oregano, salt, some freshly cracked pepper, and a pinch of the lemon zest. Whisk these ingredients until well combined. Place the chicken thighs in a small zip lock bag and add half of the dressing, saving the rest to add to the salad later. Mince one more clove of garlic and add it to the bag with the chicken and marinade. Squeeze the air out and massage the bag to make sure the thighs are well coated in the marinade. Refrigerate the thighs for at least 30 minutes. While the chicken is marinating, cook the pasta according to the package directions, drain in a colander, and let cool. Heat a skillet over a medium flame. Once hot, add the marinated chicken thighs and cook on each side until they are well browned and cooked through (about 5 minutes each side). There should be enough oil in the marinade to keep the meat from sticking. Remove the cooked chicken from the skillet and let it rest for about five minutes. 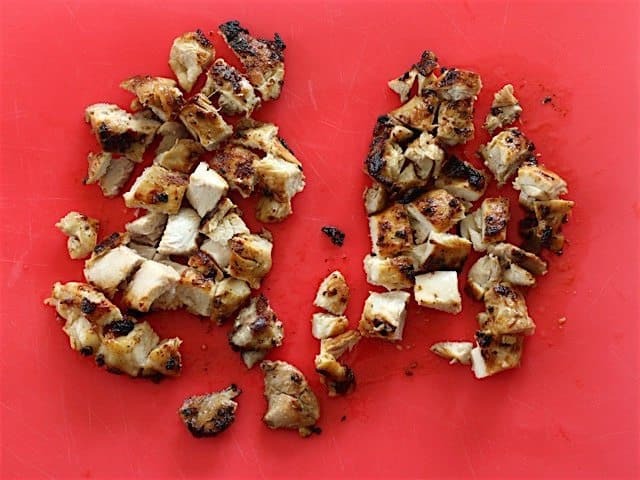 Once slightly cooled, chop the chicken into smaller, bite-sized pieces. While the chicken is cooking, prepare the rest of the vegetables. Dice the cucumber and bell pepper. Slice the tomatoes in half (or dice if using Roma or regular tomatoes). Pull the parsley leaves from the stems and give them a rough chop. Finally, build the salad. 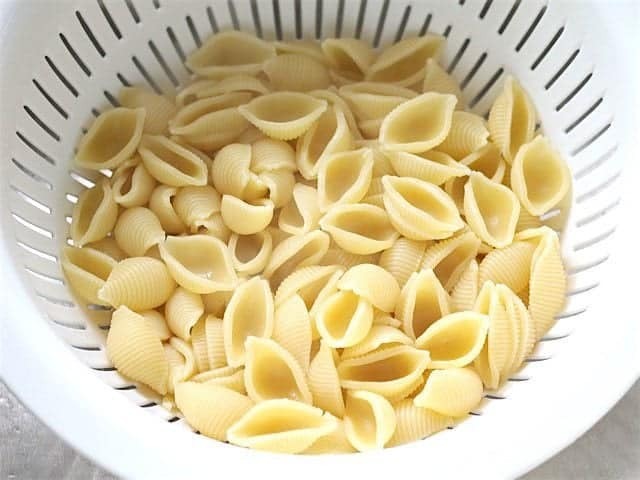 Add the cooked and cooled pasta to a large bowl. 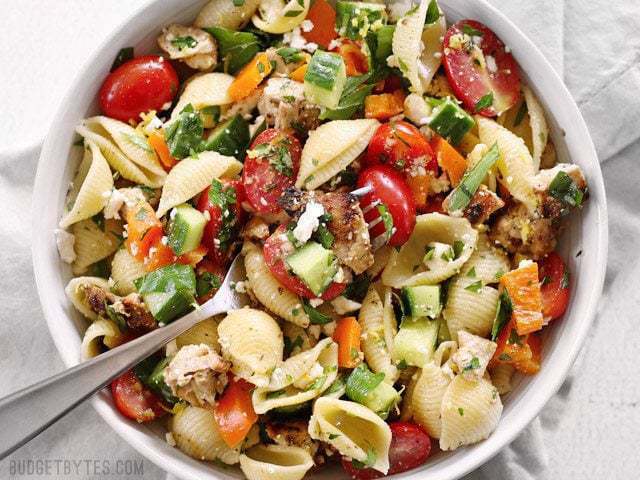 Top the pasta with the cucumber, bell pepper, tomatoes, parsley, and chopped chicken. Crumble the feta over top and add a pinch or two of the lemon zest. Pour the remaining dressing over the salad and toss to coat. Serve immediately or refrigerate until ready to eat. *I got a sale on a snack pack of grape tomatoes for $1.00, but two Roma tomatoes (diced) or one medium tomato can be used in place of the grape tomatoes. Start by removing the zest from one lemon. The zest is the magic part of the lemon. It provides an incredibly lemony flavor without making things too sour. So, for this recipe we use both the juice and the zest for an extra lemony kick. Use a zester, microplane, or small-holed cheese grater to scrape the thin layer of yellow zest from the peel. Set the zest aside. Squeeze the juice from the lemon into a separate bowl. You’ll need at least 1/4 cup of juice. Now prepare the mixture that will be used as both the dressing and the marinade. Mince two cloves of garlic and combine them in a bowl with 1/4 cup lemon juice, 1/4 cup olive oil, 1/2 Tbsp dried oregano, 1/2 tsp salt, some freshly cracked pepper, and a pinch of that lemon zest. Whisk with a fork until well combined. 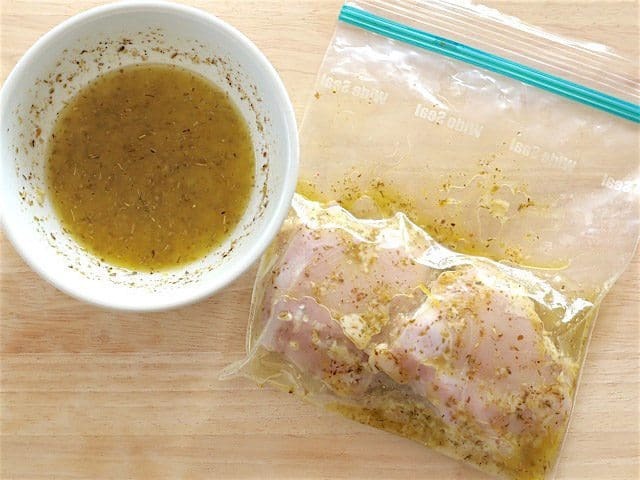 Add two boneless, skinless chicken thighs to a zip lock bag and add half of that dressing, plus one more clove of minced garlic (you really want the chicken to be garlicky!). Squeeze out all the air, give the bag a quick massage to distribute the marinade, then refrigerate the chicken for at least 30 minutes. While the chicken is marinating, cook 8oz. of pasta (any shape) according to the package directions. 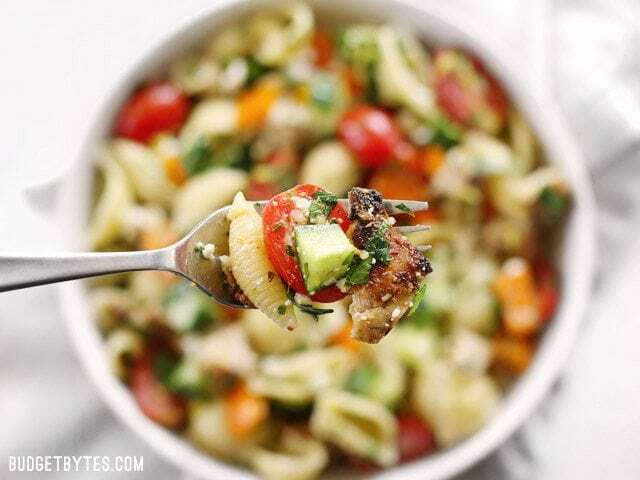 Drain the pasta in a colander, and let it cool. 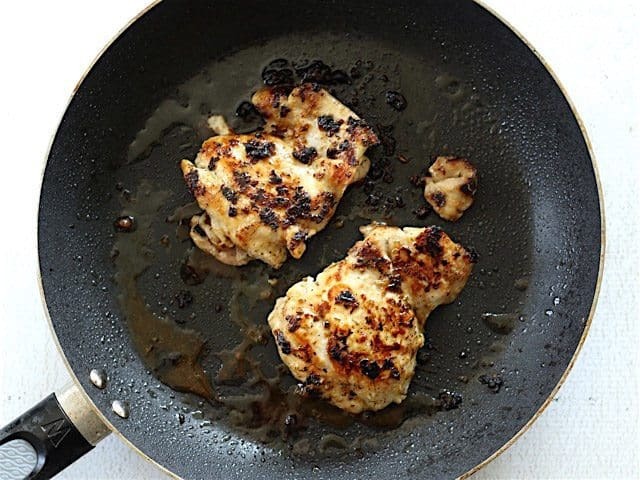 Heat a skillet over a medium flame and once hot, add the marinated chicken thighs. There should be enough oil on them from the marinade to keep them from sticking. Cook the thighs on each side until well browned and cooked through (about five minutes each side). Seriously, this chicken was SO GOOD that I’m probably going to feature it as its own recipe soon. I wanted to eat it by itself. Remove the chicken from the skillet and let it rest for a few minutes, then chop it into smaller, bite-sized pieces. While the chicken is cooking, prepare the rest of the vegetables. 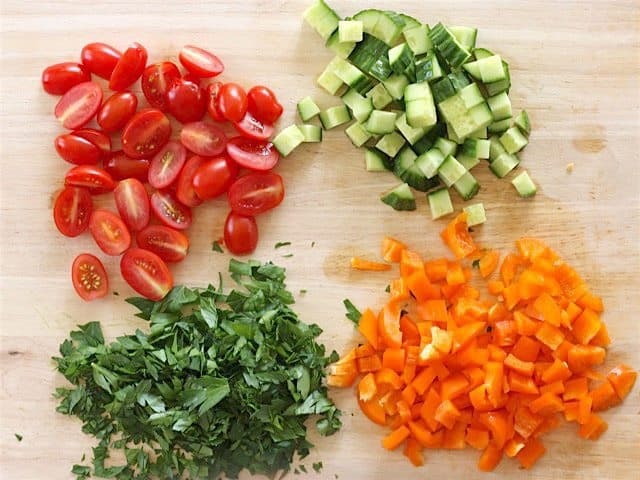 Dice 1/2 cucumber (1.5 cups diced), dice the bell pepper, slice the tomatoes in half (or dice if using Roma or regular tomatoes), and give the parsley a rough chop. Finally, it’s time to put everything together! Place the cooked, drained, and cooled pasta in a large bowl (it’s under there, I swear). 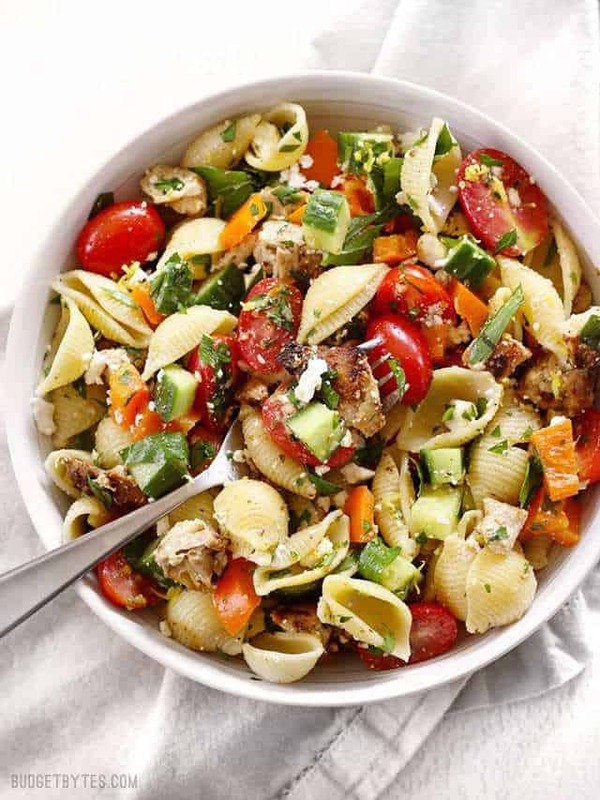 Top the pasta with the tomatoes, cucumber, bell pepper, parsley, and chopped chicken. Finally, crumble 2oz. feta over everything and add one last pinch of lemon zest. And toss until everything is coated in dressing. Done!
. 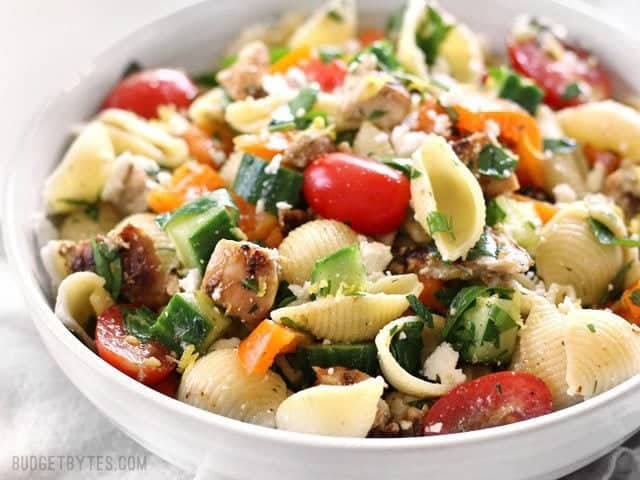 I miiiiiight have to make this Greek Chicken Pasta Salad again immediately after this batch is gone. Yeah, definitely. Loved it!! It is so yummy and refreshing. I will definitely be making it again! This was soooo good! I made mine vegetarian by swapping out the chicken and adding a can of chickpeas. I also used whole grain penne, added some red onion, zucchini, olives, and then added a serving of spinach when I ate it. Delicious!